Saturday, May 5, 2018, 10:00 a.m. to 6:00 p.m.
Sunday, May 6, 20187, 11:00 a.m. to 5:00 p.m. I will be selling both my fiber art and jewelry. This year my guest artist is Mary Mortenson, presenting her beautiful hand dyed and designed Shibori-style wearable art. Open Reception & Awards Ceremony, Friday, April 20, 7:30 p.m.
Friday, April 20, 11 a.m. – 8:30 p.m.
Saturday, April 21, 11 a.m. – 7 p.m.
Three of my pieces were juried into the exhibit: Whirling Dervish, Akasha – Divine Composition, and Memories of Dancing Harlequins & Tambourines. Whirling Dervish was given an Award of Excellence. Saturday, April 7 – Sunday 20, 2018, (T, Th, F, Sat.) 10 – 5 p.m. (Sun.) 12 – 5 p.m.
One of my fiber art pieces, Sultana, was juried into this international exhibit. Thursday, February 15 – Friday, March 16, 2018, (M- F) 8 – 8 p.m. (Sat.) 10 – 8 p.m. (Sun.) 12 – 5 p.m.
Two of my fiber art pieces were juried into this international exhibit: Harlequin’s Riddle in Juxtaposition and Sultana, Sultana was awarded Sculpture Fourth Place. Sultana was also invited to travel to the American Swedish Institute’s Arts North – Spring Edition. Artist Reception, Wednesday,January 10, 6:00 to 8:00 p.m.
Monday – Thursday 10 a.m. to 7 p.m.
Friday – Saturday 10 a.m. to 5 p.m.
One of my fiber art pieces is being exhibited: Reflections of Dragonflies & Winds of Change. Thursday, December 7, 2017 – January 7, 2018, (M- F) 8 – 8 p.m. (Sat.) 10 – 8 p.m. (Sun.) 12 – 5 p.m.
Two of my fiber art pieces are being exhibited: A Jewel of Pagoda Wisdom and Siam Treasure Chest. Saturday, September 23 – October 28, 2017, (M- F) 8 – 8 p.m. (Sat.) 10 – 8 p.m. (Sun.) 12 – 5 p.m.
One of my fiber art pieces is being exhibited: Saguna. Friday, September 22, 2017, 1-6 p.m.
Saturday, September 23, 2017, 9:00 a.m. to 6:00 p.m.
Sunday, September 24, 2017, 11:00 a.m. to 4:00 p.m.
One of my fiber art pieces, “Gift Waves,” is currently on exhibit. It was awarded Fourth Premium Place in the Plaited Basketry competition. (Monday thru Saturday) 10:00 a.m. to 9:00 p.m.
(Sunday) 11:00 a.m. to 6 p.m.
For the past several years, Minnetonka Center for the Arts has curated and managed a program of visual art displays in the public spaces of the Ridgedale Center. Six of my fiber art pieces were selected for the exhibit: Winter Sunrise, Mariposa Fiesta, Blue Papillon Contentment, Azure Copper Treasure Chest, Happy to Be!, and Aqua Reflections. All six are in the new wing to Nordstroms; three are in a glass case pedestal on the ground floor & and the other three are in a glass case pedestal on the upper floor. My fiber piece, Harlequin’s Riddle in Juxtaposition, was one of 70 pieces selected for this juried exhibit by juror, Lloyd Herman, curator and founding director emeritus of the Smithsonian’s Renwick Gallery. A catalog will be published with this exhibition. Two of my fiber pieces, Essential Elements and Heat Wave, were selected by the jurors for this juried exhibit. Opening Reception: Thursday, May 25, 6-8 p.m.
(M, W, F, & Sat.) 9 a.m. – 1 p.m.
(T & TH) 9 – 9:30 p.m.
Two of my fiber art pieces are in the exhibition: A Jewel of Pagoda Wisdom and Siam Treasure Chest. Saturday, May 6, 2017, 10:00 a.m. to 6:00 p.m.
Sunday, May 7, 2017, 10:00 a.m. to 5:00 p.m. This year my guest artist is Lori Monson, presenting her beautiful hand painted silk wearable art. More information about Lake Minnetonka Studio Tours can be found at their website: www.lakemtka-studiotour.com. Open Reception & Awards Ceremony, Friday, April 21, 5 p.m. – 8:30 p.m. I will be selling my fiber art & jewelry in the Primavera “Pop-Up-Shop”. Saturday, April 22, 11 a.m. – 7 p.m.
Sunday, April 23, 11 a.m. – 7 p.m.
Three of my pieces were juried into the exhibit: Shimmering Echoes, The Alchemy of Cinnamon, Lavender, & Frankincense, and Turkish Delight. Thursday, April 6 – May 6, 2017, (M- F) 8 – 8 p.m. (Sat.) 10 – 8 p.m. (Sun.) 12 – 5 p.m.
Two of my fiber art pieces are being exhibited: Aqua Terra Flora and Echoes from Antiquity. Aqua Terra Flora received an Honorable Mention. Open Reception, Thursday January 12, 6:00 to 8:00 p.m.
One of my fiber art pieces is being exhibited: Astoria. Friday, September 23, 2016, 1-6 p.m.
Saturday, September 24, 9:00 a.m. to 6:00 p.m.
Sunday, September 25, 2016, 11:00 a.m. to 4:00 p.m.
One of my fiber art pieces, “Harlequin’s Riddle in Juxtaposition,” is currently on exhibit and was awarded Second Premium Place in the Plaited Basketry competition. Opening Reception: Thursday, May 26, 6-8 p.m.
Two of my fiber art pieces were juried into the exhibition: Heat Wave & Essential Elements. Both pieces were photographed and featured in the June 2, 2016 Sun Sailor Wayzata newspaper. Saturday, April 30, 2016, 10:00 a.m. to 6:00 p.m.
Sunday, May 1, 2016, 10:00 a.m. to 5:00 p.m.
Thursday, April 7 – May 6, 2016, (M- F) 8 – 8 p.m. (Sat.) 10 – 8 p.m. (Sun.) 12 – 5 p.m.
Two of my fiber art pieces were exhibited: Sunflower on Silk and Paper, and Star Gazer – Opening a Window to Heaven. Friday, February 26, 5 p.m. – 8 p.m.
Saturday, February 27, 10 a.m. – 3 p.m.
Open Reception, Thursday January 7, 6:00 to 8:00 p.m.
One of my fiber art pieces is being exhibited: Gingham & Cornflower, Connecting Diamonds. September 13 thru October 17, 2015, 11:00 a.m. to 4:00 p.m.
One of my fiber art pieces, “Neptune’s Treasure Cache,” was selected by the jurors to be in the exhibit and is on display on the 1st floor, in one of the glass cases. One of my fiber art pieces, “Timeless Treasures of the Heart,” was exhibited in the Creative Activities building. Saturday, August 15, 10 a.m. – 4 p.m.
Sunday, August 16, 10 a.m. – 4 p.m. Opening Reception: Thursday, July 2, 6-8 p.m.
(M, W, F) 9 a.m. – 4 p.m.
(T & TH) 9 a.m. – 9:30 p.m. (Sat.) 9 a.m. – 1 p.m. 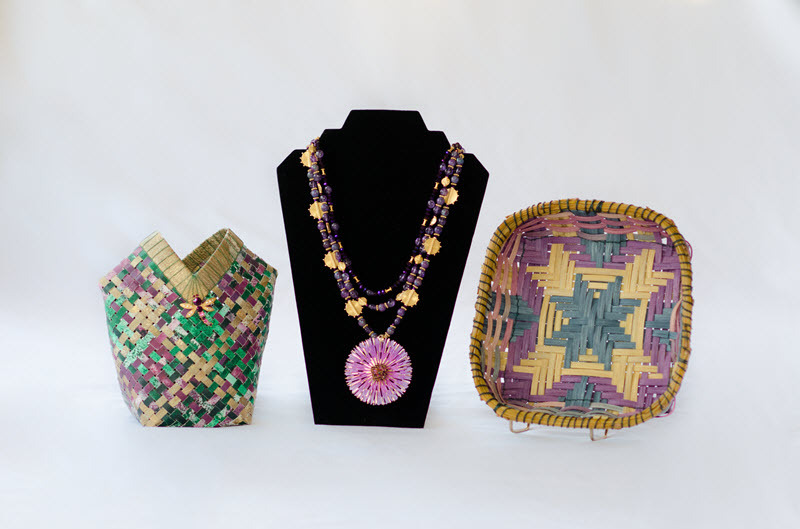 Opening Reception: Thursday, May 28, 6-8 p.m.
Two of my fiber art pieces were exhibited: Sumerian Treasure Chest & Ruby Zoisite Fiesta. May 2, 2015, 10:00 a.m. to 6:00 p.m.
May 3, 2015, 10:00 a.m. to 5:00 p.m.
Thursday, April – May10, 2015, (M- F) 8 – 8 p.m. (Sat.) 10 – 8 p.m. (Sun.) 12 – 5 p.m.
Two of my fiber art pieces were exhibited: Graceful Transcendence, and Gingham & Cornflower – Connecting Diamond. Graceful Transcendence was awarded an Honorable Mention, (see photo above). February 7, 2015, 11:00 a.m. to 4:00 p.m. Contact Lisa at ShiloaWindSong@mediacombb.net to be added to her mailing list. Copyright © Lisa Galbraith Heyl and Shiloa Wind Song. All rights reserved.